Using the rear control panel, you can also activate both air distribution positions simultaneously. In order to do this, press both air distribution buttons. The air is then routed through all rear air vents. Regardless of the air distribution setting, airflow is always directed through the side air vents. 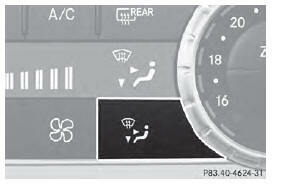 The side air vents can only be closed when the controls on the side air vents are turned downwards. ■ Turn the SmartKey to position 2 in the ignition lock . the desired symbol appears in the display.